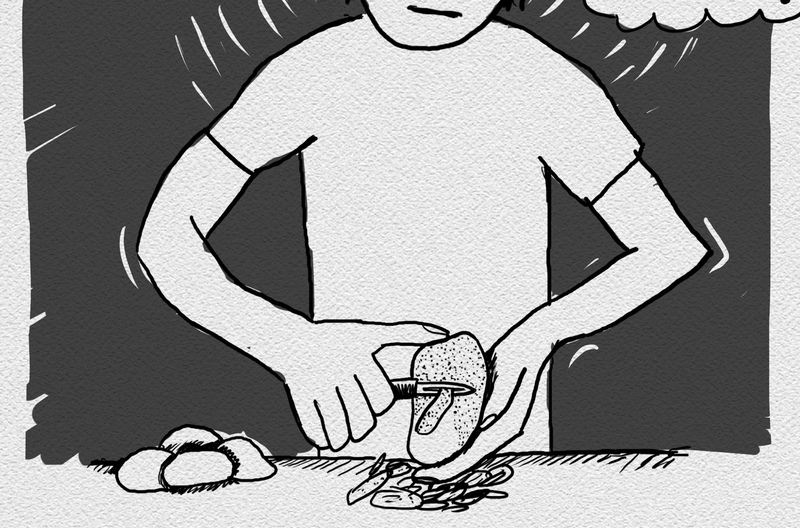 What can we learn from peeling potatoes? My latest hero for awesome advice is Alan Watts. In his books he addresses the big questions of our existence by describing and contrasting the different schools of thought of east and west. I like that he never takes sides, that he sincerely wants to put the reader in a position to decide for himself what a fulfilled life could look like. And the best: according to Zen tradition Alan knows that life is far too serious to take it too seriously, and that often the only way to face a difficult situation is trying to see the comic side of it. 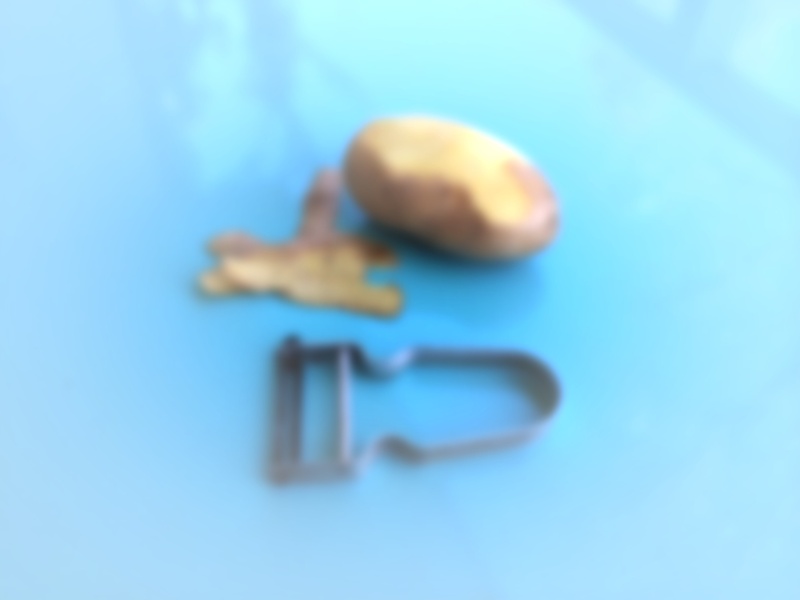 How hard can it be to peel a potato? Life certainly puts bigger obstacles in our way. Using the image of peeling potatoes is Alan’s way of trying to make us smile, allowing us to look at the problem we’re facing from a different angle. The image is not intended to make fun of your situation, it should simply remind us that we’re not alone with our problems, that other people are “peeling their potatoes” right now. He wants to encourage us to face whatever problem we’re facing: “Go ahead, peel your potatoes! This is probably the best thing you can do!” He knows from personal experience how difficult it is to face the truly big questions in life: Getting older or finding the balance between earning money and doing what we’re passionate about. Peeling potatoes is a gentle reminder that we should use the challenges in front of us as opportunities to learn and grow. The word God is a reminder to never forget that that we are part of something that started before we were born and will go on long after we die. We might call it universe, nature or anything else. The more we want to name it, the more we try to understand everything using our mind alone, the more we risk losing the connection to the world and to the people around us. Does your mind really know what is good for you? Don’t let the mind convince you that peeling potatoes is bad or you will never enjoy the earthy smell of a home made Shepard’s Pie cooking in your oven. With all our awareness stuck in the past or the future, you will start feeling like this: disconnected from your surroundings, cut off from the people who love you, alone with your problems. With the mind pulling us out of the immediate experience, the world around us will fade away, become fuzzy, bland, boring. It is as if the mind is trying to convince us that reality can only be found in our thoughts, that the only way to address the “potato in front of us” is by getting lost in our mind. The mind is a wonderful, probable the most sensitive organ. It has this amazing ability for language and abstract thought. Without it no communication across time and space would be possible. It is so powerful that we seem to forget, that it is only one of many sense organs. Smell, taste, touch, sight, hearing, our whole nervous system allow us to stay in contact with the world around us in a more direct way – a direct gateway to become fully aware of the world we’re living in. If we concentrate on the sense of sight, peeling potatoes will look like this: full of colours and different textures, the sunlight travelling through space illuminating the scene in front of us. By bringing our attention to our senses we can re-establish the connection to the world around us, grounding us in the immediate experience. This will help to calm the mind by bringing it into the moment, instead of letting it churn through past memories or future possibilities. The world around you, your situation will not change. But the immediate experience will offer a different point of view, just “peeling potatoes” will help you appreciate the simple fact of being alive, of being able to use your sense organs on this planet. Holding on to this sense of openness, we can find all truth in ourselves. Remembering that the only thing we can do is to make the best out of the moment we’re in. By reconnecting with the world through our senses, we can reconnect to ourselves, the people around us, the cat sitting in your lap, the universe. This connection will give us the strength to take the next step, so that we can be there for ourselves, our family and friends or a stranger in need. But how about to switch on oven ? 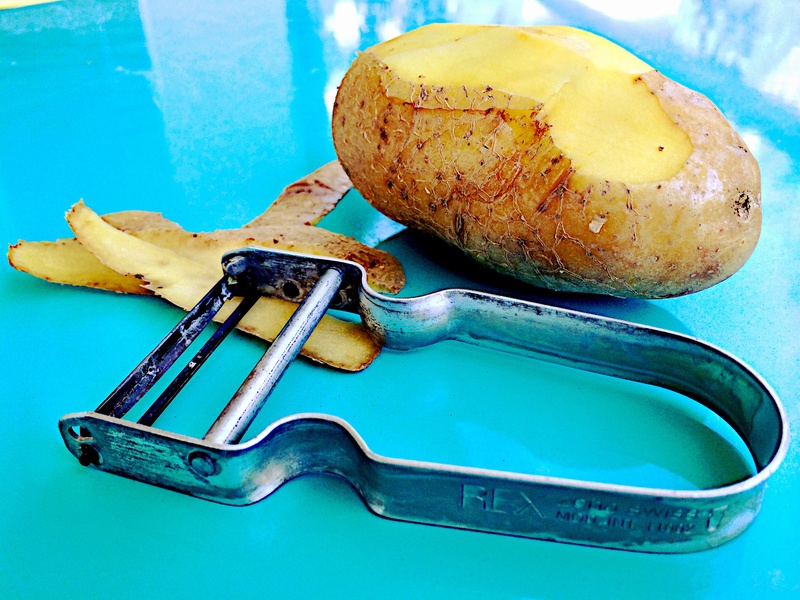 in what time we decide to manage things – for which we peeling potatoes !? That is good to be connected with things, which we do at exact time, but i think it’s good to know for what we actually doing it…, before we start !? I suppose often situation is that we are afraid to sop peeling them… as we don’t know what we will do with it … and that’s make us wonder in peeing process… ?